This version of the popular 99 Whippy Ice-cream on Waffle cone with flake & Chocolate sauce has a metal bracket for attaching to the wall. It is ideal if you are unable to use a free-standing pavement point-of-sale model. 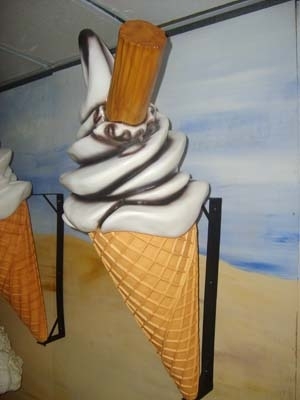 Soft Whippy ICE-CREAM, Hanging version, Waffle-Cone with Flake point-of-sale display model – CHOCOLATE SAUCE - with metal bracket for hanging on wall. The Jollyroger’s Ice cream point-of-sale models are fantastic promotional items to advertise your range of ice-creams to the public & are the best way to attract customers to your shop, kiosk or concession. The detail of our Ice-cream cone models makes them much more realistic than others on the market, they really do stand out. The ice cream looks mouth-wateringly realistic & will help generate extra sales for your business. The 4ft tall replica Ice cream is fully 3D; the model is made of high-quality, durable cold cast poly-resin & fibre-glass..not plastic, &, well cared, for will attract customers for many years to come. 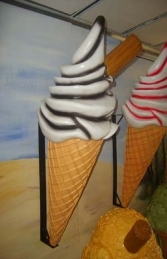 We do recommend that the ice cream statues should be lacquered or varnished if used outside. This 4ft high 3d Ice-cream display model is also available in a free-standing pavement version. NB -DELIVERY - This 4ft Ice cream model can be sent via a business post service to you for £20 (to any mainland UK address) postage & packing & be with you & attracting customers within 2 working days. To avoid disappointment do please call Chris or Lee to ensure we have the particular model you require in stock & to arrange payment & delivery. PLEASE CONTACT US ON 01626 833646 or 07860 680181 TO ORDER THIS ICE-CREAM MODEL & THE OTHER POINT-OF-SALE MODELS IN OUR RANGE.